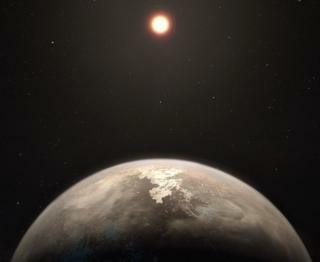 Astronomers have found a cool, Earth-sized planet that's relatively close to our Solar System. The properties of this newly discovered planet - called Ross 128 b - make it a prime target in the search for life elsewhere in the cosmos. At just 11 light-years away, it's the second closest exoplanet of its kind to Earth. But the closest one, known as Proxima b, looks to be less hospitable for life. Found in 2016, it orbits the star Proxima Centauri, which is known to be a rather active "red dwarf" star. This means that powerful eruptions periodically batter Proxima b with harmful radiation. The new planet, Ross 128 b, orbits a star that's not dissimilar to Proxima Centauri (it's also a red dwarf), but is significantly less active. Where should we look for alien life? Co-discoverer Nicola Astudillo-Defru from the Geneva Observatory in Switzerland told BBC News: "Just because Proxima Centauri blasts its planet with strong flares and high energy radiation, yes, I think Ross 128 is much more comfortable for the development of life. "But we still need to know what the atmosphere of Ross 128 b is like. Depending on its composition and the reflectivity of its clouds, the exoplanet may be life friendly with liquid water as the Earth, or sterile like Venus." Lead author of the study describing the find, Xavier Bonfils, from the Institute of Planetology and Astrophysics in Grenoble (IPAG), France, told BBC News: "Ross 128 is one of the quietest stars of our sample and, although it is a little further away from us (2.6x), it makes for an excellent alternative target." The new world was discovered with the High Accuracy Radial velocity Planet Searcher (Harps) instrument at the La Silla Observatory in Chile. The work will be published in the journal Astronomy & Astrophysics. Dr Astudillo-Defru said the find was the result of more than a decade of "intensive monitoring" using the Harps instrument. At 1.35 times the mass of our planet, Ross 128 b is a bit heftier than Earth and orbits 20 times closer to its star than we orbit the Sun. But because the new planet's parent star is much smaller and dimmer than our yellow sun, it receives only a little more solar radiation than Earth. Consequently, it is expected to have a surface temperature close to that on our own planet. In the search for habitable worlds beyond our Solar System, astronomers generally look for low-mass, rocky and temperate planets like ours. But these are comparatively difficult to detect; most of the 3,500 known exoplanets are so-called Hot Jupiters - huge gas giants orbiting very close to their parent stars that don't have suitable conditions for life. Of the smaller contingent of Earth-sized planets, the vast majority orbit red dwarf stars - the most common type in the Milky Way. Because this category of star is dim, it's easier for astronomers to detect low-mass planets when they pass in front (as viewed from Earth), blocking out a portion of the light. Red dwarfs are generally more active than G-type stars like the Sun, but there's underlying variation. At "just" 4.2 light-years away, Proxima b may be the closest exoplanet with a mild temperature. But it receives about 30 times more extreme ultraviolet radiation than Earth. Ross 128 b, on the other hand, is the "quietest" nearby star to host a temperate exoplanet. Astronomers often talk about the "habitable zone" around a star - it's the range of distances where temperatures allow water (essential for life as we know it) to remain liquid on the surface of a planet. Where the habitable zone lies depends on the star itself: red dwarfs are dimmer and therefore cooler than the Sun, so their habitable zones are shifted closer in than the equivalent zone in our Solar System. There's still uncertainty about whether Ross 128 b is within its star's habitable zone, but scientists say that with temperatures of between -60 and +20°C, it can be considered temperate. But, as Dr Astudillo-Defru alluded to, a lot depends on the presence of an atmosphere. An envelope of greenhouse gases can warm the surface and provide sufficient pressure to keep water in the liquid state. Next, astronomers want to study the atmospheric composition and chemistry of suitable, nearby worlds like Ross 128 b. The detection of gases such as oxygen could potentially point to biological processes. But Nicola Astudillo-Defru told me: "It is still a debate what are the best biomarkers. For now we have di-oxygen (O2) and ozone as good bio-markers, others like carbon dioxide or methane can be generated both from geological events or life. For sure we will start looking for these species and water vapour." Several gases have already been detected in the atmospheres of exoplanets, but this line of enquiry is expected to be boosted immeasurably when observatories such as the European Southern Observatory's Extremely Large Telescope (ELT) and Nasa's James Webb Space Telescope (JWST) get going in coming years. "When the ELT comes online (at the middle of the next decade) it shall provide both the collecting power and the angular resolution to observe Ross 128 b directly. We will be able to see if it has an atmosphere and, eventually, to search for O2, water and CH4 (methane)," Dr Bonfils explained. "Each one would be super exciting and an important step toward the evidence of life outside our Solar System. Yet, individually, none is a definitive proof for life. There are ways to produce either O2 or CH4 abiotically. However, for now, we don't know any false positive if all three were to be detected together." Although currently 11 light-years from Earth, the new planet's parent star Ross 128 is moving towards us and is expected to overtake Proxima Centauri as our nearest stellar neighbour in just 79,000 years - a heartbeat on cosmic timescales.